If basil declares that summer has arrived in the vegetable garden, then cheerful echinacea shouts it out from the flower bed. Summer is here—in a hot, humid, stripped down, and extremely sweat-drenched way. It's already been in the 90s for over a week, and there's no end (and no rain) in sight. It just keeps getting hotter. The heat index is supposed to get up to 108 on Saturday, but our thermometer in the backyard (yes, I stupidly looked) says it's already there. It feels as if we went from the middle of June to the middle of August overnight. We really need to be putting up the hay (which will feed the sheep and donkeys next winter), but it's simply way too hot to do that kind of strenuous work—we'd never survive. It's too hot to do pretty much anything outdoors, though you wouldn't know it from looking at the echinacea. There are several species of echinacea, but echinacea purpurea, also known as purple coneflower, is the most common and probably the easiest to establish in the garden. I originally started some from seed years ago at my first farm, and then dug up and brought a few of those plants with me when I moved to this farm nine years ago. I also started some echinacea angustifolia, narrow leaf coneflower, but it didn't make the move. The seeds were pretty easy to start, but you can also find echinacea seedlings for sale at nurseries and garden centers. If you have a friend or neighbor who has some growing, ask them if they'll share. Echinacea is everything I claimed in the title of this post and then some. It was supposed to say Self Seeding, Pollinator Attracting, Poor Soil Loving, Insect Resistant, Cold Tolerant, Pretty Much Impossible to Kill as well, but Blogger said the title was too long. I've found that the less I pay attention to my echinacea, the more it flourishes, though I'm sure it would probably go crazy if I fertilized it with a little sheep manure. You'll find sweeping roadside displays of wild echinacea blooming along Missouri highways, often growing out of what looks like solid rock. My echinacea, which conveniently starts to flower just as my beloved spiderwort is petering out, blooms all summer long and doesn't require deadheading. And if you never get around to cutting off the seedheads in fall, they'll simply drop to the ground and start sprouting up on their own come spring, while the dead flower stalks fall over or are buried in the lush new growth of old and new plants. Results of archeological digs indicate that Native Americans may have used echinacea for more than 400 years to treat infections and wounds and as a general "cure-all." Throughout history people have used echinacea to treat scarlet fever, syphilis, malaria, blood poisoning, and diphtheria. Today, people use echinacea to shorten the duration of the common cold and flu and reduce symptoms, such as sore throat (pharyngitis), cough, and fever. Many herbalists also recommend echinacea to help boost the immune system and help the body fight infections. Several laboratory and animal studies suggest that echinacea contains active substances that enhance the activity of the immune system, relieve pain, reduce inflammation, and have hormonal, antiviral, and antioxidant effects. For this reason, professional herbalists may recommend echinacea to treat urinary tract infections, vaginal yeast (candida) infections, ear infections (also known as otitis media), athlete's foot, sinusitis, hay fever (also called allergic rhinitis), as well as slow-healing wounds. On top of all that, it's beautiful, especially since the flowers look different at every stage. If you're looking for a winning perennial in the garden, I highly recommend echinacea. 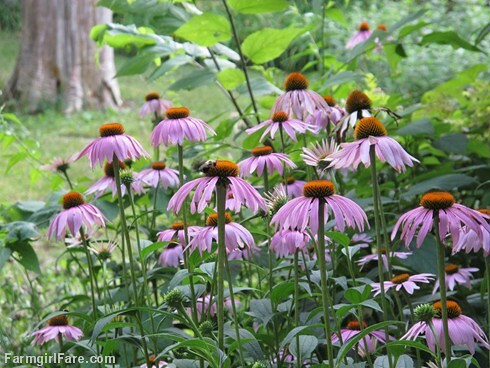 Is there echinacea growing in your garden? © Copyright 2009 FarmgirlFare.com, the hot stuff foodie farm blog where the donkeys (and the rest of us) may be wilting, but the first green beans are ready! Yes I have numerous Purple Coneflowers in my gardens...it even tolerates shade in some places...Mine are just starting to bloom...at the end of the season, I enjoy watching the Goldfinch pulling at the seed heads! Hello Susan. I am a recuperating un-gardener. I was always an enthusiastic gardener and had about 1300 sq ft of perennial beds and borders in central Ohio. Then we moved to Puget Sound. There, although something blooms all year around, I was unable to establish aa garden. Now, after 10 years, we are back in NW Ohio and I am making up for lost time. I have created three raised beds for veggies and one smallish and one largish bed for perennials in front of the house. I am so happy to be able to go outside and stroll through the gardens and watch the magic of plants growing, producing food and blooming. My very favorite perennial is your topic today, Echinacea!. I tried starting seed with only marginal luck and very slow growth. I bought a six pack of dry rooted plants online but only 4 survived and only two of those are of any size. I'm sure I won't get bloom this year, but look out next year. And if they don't come on strong, I WILL purchase established plants at a nursery. Anyway, I greatly enjoyed your post today. Thank you for some very enjoyable reading. WOW!! Why haven't I started growing this yet?? Is it too late to sow this year, do you think? 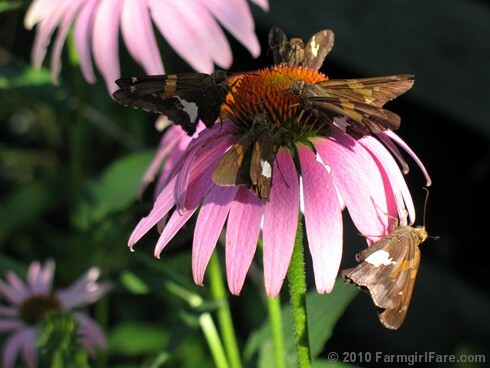 Have you ever tried a different color of coneflower? I bought a "black" coneflower a few years ago, but it never bloomed or flourished. Recently I saw Coconut Lime Coneflower (white with a beautiful green center) advertised for sale. I think I will definitely be adding that color to my garden this fall. Oh yes, it was one of the first things on my list when I got a yard. I purchased it from the farmers' market, and it is close to blooming. It is all over my neighborhood and the larger established plants are blooming. No echinacea but we certainly do have heat! :) Luckily we are expecting some light precipitation over the next few days for some relief. I can relate to your sweat drenched state. How do you use the echinacea? Do you use just flowers, or just leaves, or both? Is it used primarily as a tea? I'd love to hear your input. Thanks for your comments. It's great to hear from other echinacea lovers - and it's even more wonderful to be able to introduce this fabulous perennial to those of you who aren't familiar with it. It's probably not too late to add some echinacea to your garden. If you can't find any plants for sale, try starting some seeds in containers. Then when they get big enough (and once it cools down, if you're in a hot summer area), you can transplant them wherever you like - or even keep them growing in pots until next spring. It's definitely worth a shot - I think you'll really love having some echinacea around. It's always nice to hear from a former lurker (that word just cracks me up : ). Oooh, Coconut Lime Coneflower - how delicious does that sound? I'm afraid I've been pretty content with my plain old purple coneflowers. I definitely need to change that! Thanks for the heads up. You can use the leaves, flowers, and roots of echinacea. The root is the strongest part of the plant, but, according to this informative article, which includes recipes for homemade herbal remedies, you have to wait three years before you use it because the plant's constituents must mature. You'll find lots more links to using echinacea here. 1) I need echinacea for the garden. 2) I wish I could send you our rain. We're drowning here in New England. I remember when country roadsides were lined with purple cone-flowers in the summer. They were almost a weed. Then the herbalists noticed them, and they almost disappeared. I've seen them for sale at plant nurseries for $10 or $12 per plant. I live near a big county park, so the birds have replanted them in my yard. I'm glad to see them back, but it's weird to be grateful to see them, because I remember when they were deemed weeds and a nuisance, and now I'm thrilled to see them at all. So are the birds. I have only a couple echinacea plants because I didn't feel the need to feed the Japanese beetles any more than that - the beetles appear every year when the blooms do. But this year the beetle numbers seem to be way down (mid-Eastern Shore Maryland) and I'm enjoying having enough blooms for both vases and garden. I guess you don't have Japanese beetle issues there, or that they have plenty else to eat?